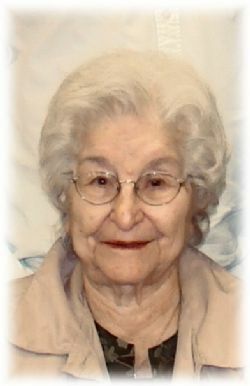 Christina Marie (Becker) Schluterman was born on January 24, 1929 and died on February 11, 2019 at the age of 90. Christina married George H. Schluterman on June 22, 1948. She was a member of St. Joseph Catholic Church, St. Joseph Altar Society and the Tuesday Morning Quilters Group. She was preceded in death by her husband George H. Schluterman of 51 years; her parents, Francis A. and Mary F. Becker; two brothers, Peter Becker and Joseph Becker and two sisters, Delores �Bobby� Jackson and Mary Sargent. She is survived by her children, Carolyn Cousins and husband Jerry of Little Flock, Arkansas, Roselyn Sharum and husband Larry of Central City, Arkansas, Susan Stewart of Fort Smith, Arkansas, George V. Schluterman of Oklahoma City, Oklahoma, Mary Upchurch and husband Kuper of Fort Gibson, Oklahoma and Sarah Tasler and husband David of Van Buren, Arkansas; twelve grandchildren, Kevin Cousins and wife Tara of Aurora, Colorado, Christopher Cousins and wife Carrie of Little Flock, Aaron Cousins and wife Alena of Fairborn, Ohio, Blake Stewart and wife Rachel of Springdale, Arkansas, Michelle McCoy of Wister, Oklahoma, Alicia Gregory and husband Jamie of Clarksville, Arkansas, Greg Sharum and wife Cassie of Greenwood, Arkansas, Jeff Sharum and wife Falone of Greenwood, Arkansas, Meredith Strickland and husband Tony of Springdale, Arkansas, Adam Upchurch of Tulsa, Oklahoma, Stephanie Hampton and husband Dustin of Van Buren, Arkansas and Anthony Tasler of Van Buren, Arkansas; one brother, John Becker of Fort Smith, Arkansas; two sisters, Imelda Reber of Houston, Texas and Elizabeth McAnnally of Hot Springs, Arkansas and twenty great-grandchildren. Visitation will be from 6:30-7:30 p.m. with rosary starting at 7:30 p.m., on Friday, February 15, 2019 at St. Joseph Catholic Church in Paris. Funeral mass will be held at 10:00 a.m., on Saturday, February 16, 2019 at St. Joseph Catholic Church in Paris officiated by Fr. Eugene Luke O.S.B.. Burial will follow in St. Joseph Catholic Cemetery in Paris under the direction of Roller Funeral Home. Pallbearers will be her grandsons. Memorial contributions may be made to the St. Joseph Catholic Church Building Fund, 15 S. Spruce St., Paris, AR 72855 or Mercy Hospice, 3300 S. 70th St., Fort Smith, AR 72903. Site by Gemini Graphics Inc.